Police have praised the bravery of shop staff who detained a man armed with a screwdriver after two people were injured. 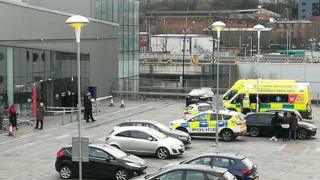 The assault happened inside a Tesco store on Savile Street, Sheffield, at about 13:30 GMT. A woman, 58, and a man, 45, were treated at hospital for minor facial injuries, South Yorkshire Police said. A man, 23, has been arrested on suspicion of attempted murder and is in custody. Ch Supt Stuart Barton said: "Staff inside the store acted incredibly quickly, giving immediate medical attention to the man and woman who were injured. "They were incredibly brave in doing so." The store has been evacuated and remains closed.